Aquatic pets are perhaps some of the most underrated pets, especially when compared to the fluffier, huggable contenders like dogs, cats, or even hamsters. What they lack in cuteness or fur, however, they make up for in vivid colourations, unique personalities, and uniqueness. That said, if you’re thinking of venturing into the uncharted waters of the reefkeeping hobby, you’ll want to start with a 25 gallon fish tank. Generally, experienced aquarists will tell you that the larger the tank, the more stable and more forgiving it becomes. As a general rule of thumb, toxins, decaying materials, and other impurities have a much less chance of decimating your tank if it has more water to dilute them. The biggest drawback from bigger tanks, however, is that their stability comes at a steep price; lights, wavemakers, skimmers, just to name a few, could drive your initial expenses up to more than a thousand bucks! That doesn’t even include the recurring cost of salt mix and other additives you will have to purchase to keep larger systems stable. A 25 gallon fish tank achieves the balance between the unstably small and the expensively large tanks; it gives you enough room to add interesting fish, corals, and other creatures, without the need for more expensive equipment. They are also the perfect size for people who want to put tanks in their dorms, offices, or other places that don’t have a lot of space. What Kind of Tank Do You Want? What kind of scenery do you prefer? I want a busy scenery; fish zipping from corner to corner, and lots of movement, like a freshwater community tank. I’d like to have enough fish to make the tank interesting, and perhaps some low maintenance shrimps, starfish, corals, and/or other invertebrates. I’d like to have a slice of the whole ocean, please. How much time can you allocate per day for your tank? Are you prepared to spend more money on your tank? I’m on a budget; I want only the equipment I really need. I could go for better quality equipment and possible upgrades in the future. I throw my money in the fire when I’m bored. If you answered (a) for 2 out of the 3 questions, then you’re most likely going to benefit from a fish only with live rock (FOWLR) tank. As the name suggests, you keep only saltwater fish and some rubbles that act as biological filtration. Some hitchhikers like small crabs, feather dusters, and even small corals might find their way into your tank from the live rock, but your focus here is mostly keeping fish with the lowest cost equipments with the least amount of time. If you answered (b) for 2 out of the 3 questions asked, then a reef tank with some low-maintenance corals and invertebrates might be more suitable. This will give you a tiny sliver of the wonders of the ocean, without actually breaking the bank. If you answered (a) for 2 out of the 3 questions asked, then you are most likely ready for a full reef setup. This means that you’ll be able to enjoy must of what the ocean has to offer; the only limitation you face is the relatively cramped quarters of the 25 gallon fish tank. For a FOWLR tank, you can get a regular or rimless tank for a low price, if you plan on setting up a reef tank, an all-in-one (AIO) tank is advisable, as it already separates a small section of the tank for some filter media, macro algae, and perhaps reef-risky inhabitants that you still want to keep. In nano tanks, protein skimmers are usually not required, since you can do frequent 20% water changes every week to remove waste. If you, however, plan on keeping a lot of fish or plan on feeding frequently, a protein skimmer should help you keep your nutrient levels down so that nuisance algae won’t take over. Generally, having filter floss in your HOB filter isn’t advisable; you only need filter floss when you have floating particulates you want to remove. Activated carbon, phosphate remover, and other forms of chemical filtration like Purigen by Seachem aim to make the aquarium water as pristine as possible for more sensitive invertebrates, so consider only buying chemical filtration if you’re going for more sensitive inhabitants like shrimp. If you’re going to go with a FOWLR tank, you can pick whatever light you like. Generally you’ll want lights made for saltwater tanks. These generally have whites that have 10,000k colour temperature, as well as some royal blue LEDs, and better protection from salt and water (saltwater is a good electrical conductor!). People, in fact, have had great success keeping some low-maintenance corals with 10-20w LED floodlights (10,000k colour temperature). For more high-maintenance corals, and perhaps clams, you can’t go wrong with par38 full spectrum LED reef bulbs. They’re pretty much plug-and-play since they fit into standard light bulb sockets (E27), so you can create a manual mount for them above your aquarium, or buy specialised clip-on gooseneck fittings. Refractometers accurately measure the level of salinity (saltiness) of your tank water, so this is arguably one of the most important equipments you’ll ever need, regardless of your setup. Since you’re keeping a small, 25 gallon fish tank, you only need an ammonia, nitrite, and nitrate test kits to check for the waste in your tank and whether or not it’s safe to add fish, and whether or not it’s time for a water change. Tests for alkalinity, calcium, etc. 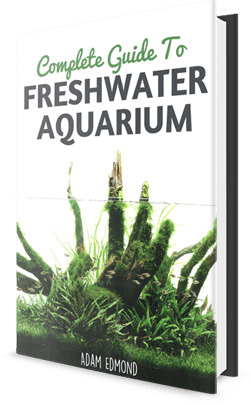 are necessary for advanced aquarists who keep demanding SPS and clams, which means that the rate at which calcium and other necessary trace elements drop cannot be replenished by their scheduled water change routines. Some aquarists go for a bare bottom tank, which means that they don’t put any sand at all. This makes keeping the tank clean much easier, since you can easily siphon out detritus. 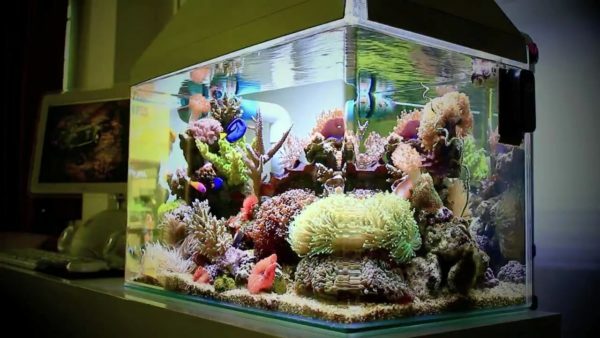 If you wish to keep sand sifting inhabitants, however, or simply want a more natural look, you can go buy aragonite reef sand to keep your aquarium water pH stable. No matter what kind of setup you want, live rocks are a necessity, as they add more surface area for beneficial bacteria to live in, as well as giving shier and smaller fish more secure holes to hide in (ironically, the more holes and crevices these fish see, the more secure they are swimming in the open). You can buy natural seawater in some pet shops, but this can result to parasites being transported to your tank. Instead, buy some quality reef salt and create your own saltwater. Instant Ocean (for FOWLR tanks), and Reef Crystals or Aquavitro Salinity are just some of the top contenders. So far, you’ve been presented with the things you may need to set up the best 25 gallon fish tank for the kind of ocean you want to imitate. This article is just the tip of the iceberg; there is still the process of setting up your aquarium, maintaining it, and picking the right fish. Once you believe you’re ready to take on the responsibilities – both financially, mentally, and physically, for a saltwater tank, then you know you’re ready for the rewarding experience of being a saltwater reefkeeper.